The Fabbian Lumi Mochi pendant light LED is characterised by its rounded, satin-finished diffuser made of hand-blown glass. The imperfectly round shape reminds of traditional Japanese rice cakes (called mochi), from which the pendant light by Fabbian owes its name. The smooth glass surface underlines the gentle appearance of the Lumi Mochi LED. In this way, the pendant light blends with practically any interior design concept thanks to its reduced design but also for its harmonious lighting effect. The Lumi Mochi Pendant light LED Pendant lights was designed by A. Saggia and V. Sommella for Fabbian. The flawless glass shade is made of hand-blown opal glass. 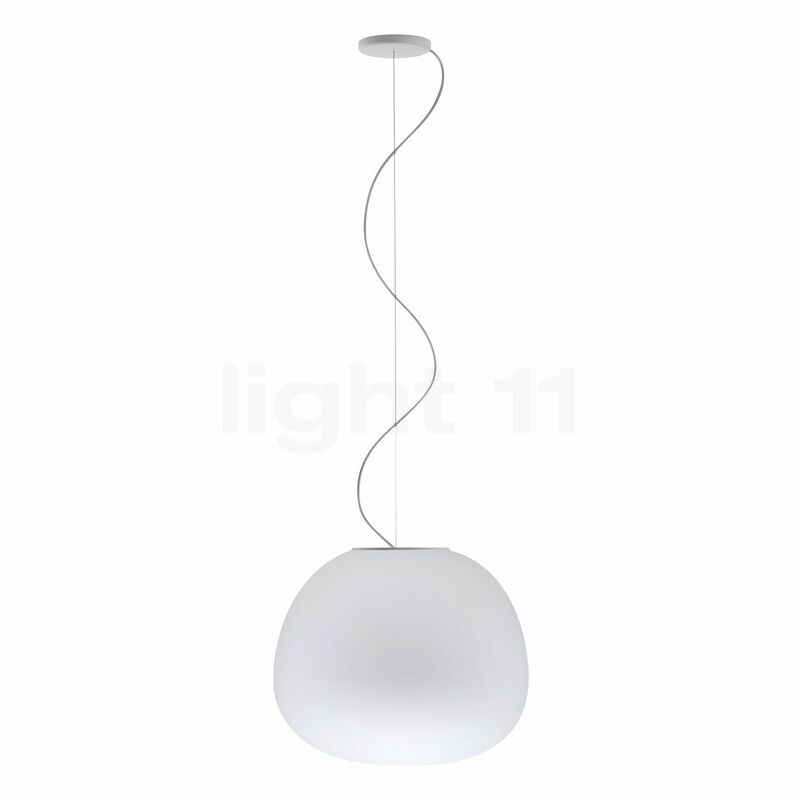 The elegant pendant light is available in numerous sizes. The Lumi Mochi is suspended from the ceiling by means of a cable. The Fabbian Lumi Mochi pendant light LED evenly emits its warm-white light with a colour temperature of 3,000 Kelvin in all directions. 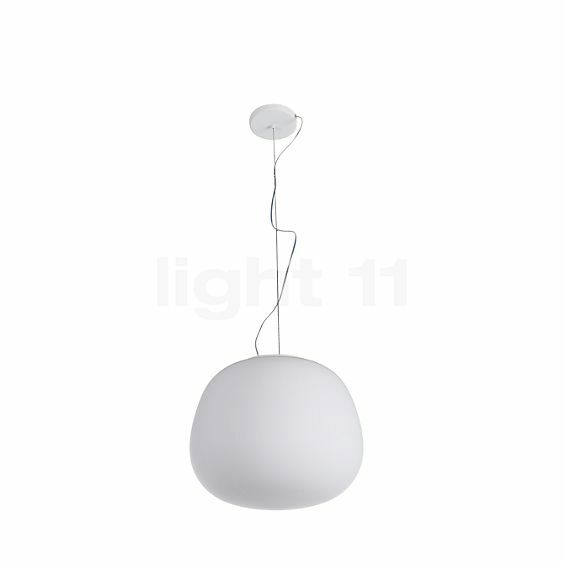 Thereby, the pendant light suffuses the room with a nice base lighting, which invites you to sit back and relax. In addition to its pleasant lighting effect, the Lumi Mochi LED is highly energy-efficient. The pendant light by Fabbian is equipped with an economical LED module that only consumes 17 watts to generate a luminous flux of 1,850 lumens. This means that the Lumi Mochi outperforms a 100 watts incandescent lamp by far. In order to dim the pendant light, a TRIAC phase-angle dimmer is recommended. Tell other customers and us about your experiences with the Lumi Mochi Pendant light LED ! The Lumi Mochi LED is suitable for many areas of application. The pendant light provides living rooms, bedrooms as well as dining rooms with a pleasant base lighting. The light is evenly emitted into the whole room thanks to the satin-finished glass shade and thereby creates a relaxing atmosphere. Due to its discreet design, the Fabbian Lumi Mochi pendant light LED may also be installed in a commercial area. There, the pendant light by the Italian light manufacturer Fabbian impresses by its inviting lighting effect, which really comes into its own in foyers, receptions and entrance areas.